When it comes to maintaining a healthy diet, people usually fixate on the restriction part — like counting calories or carbs, and staying away from the “bad” stuff like sugar and fat. I’ll admit — I’m not a big fan of counting calories or carbs or fat grams. But staying away from the bad stuff — foods that rob us of our energy, make us gain weight, or weaken our immune system — is indeed important. And it’s just as important — just as powerful — to focus on expansion. 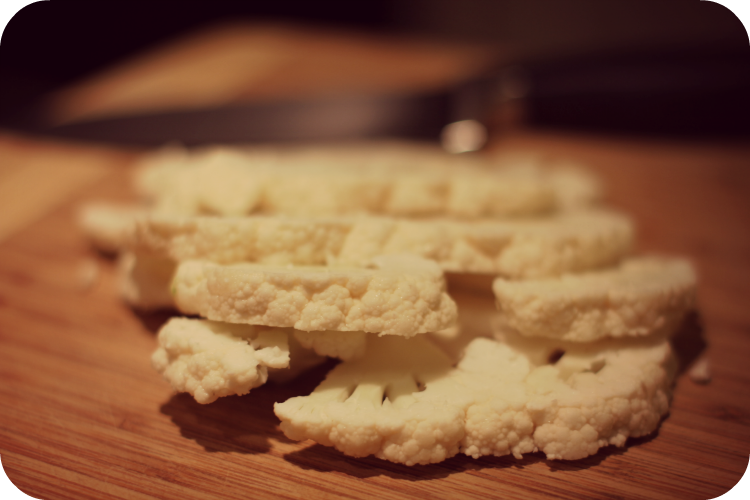 Expansion, in this case, means considering the full range of whole, unrefined foods that are beneficial to our bodies. And not just having a green smoothie every morning and calling it good. Which is an excellent start, of course… but why stop there? If you want to follow a truly healthy diet, it’s all about variety. And I don’t mean a variety of proteins, as in eggs for breakfast, chicken for lunch, and beef for dinner. What I’m talking about here is enjoying a wide range of vegetables and fruits — whether you eat animal protein or tofu and tempeh. Because all of the wonderful disease-fighting, anti-aging, cancer-busting antioxidants we need are found in vegetables and fruits. And not in that steak. Or tofurkey, for that matter. 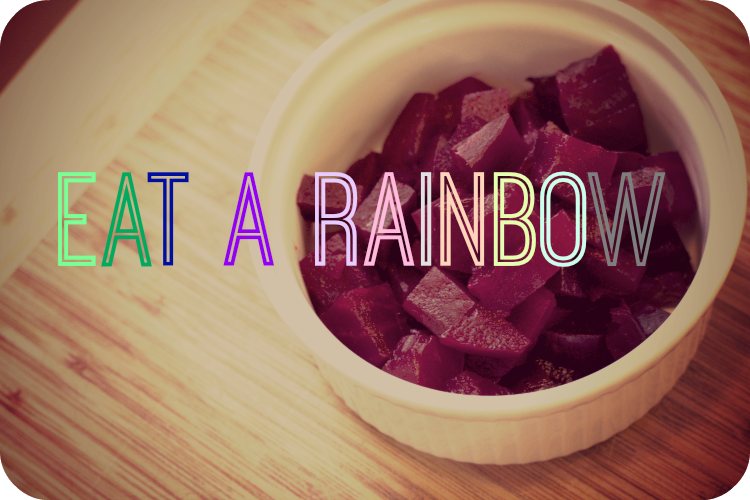 Telling people to “eat a rainbow” feels a little too hippy-ish to me (unless I’m talking to first graders!) but it’s still a helpful message. The key takeaway is this: your body needs a wide variety of phytonutrients (plant-based nutrients) to thrive, and all you need to do to access these nutrients is try to eat all or most of the major color groups every day. Red: Foods such as tomatoes, watermelon and red bell peppers provide lycopene, which has been found to counteract certain kinds of cancer, particularly prostate cancer. Blue/Purple: Purple cabbage, blueberries, and blackberries provide protective flavonoids that support heart and brain health, and can lower the risk for metabolic syndrome and diabetes. Green: Well, we all know leafy greens are good for us, right? But why? Green, non-starchy vegetables such as kale, spinach and bok choy contain carotenoids, beta carotene and chlorophyll that are important for eye and arterial health, cell function and healing, and healthy gums. 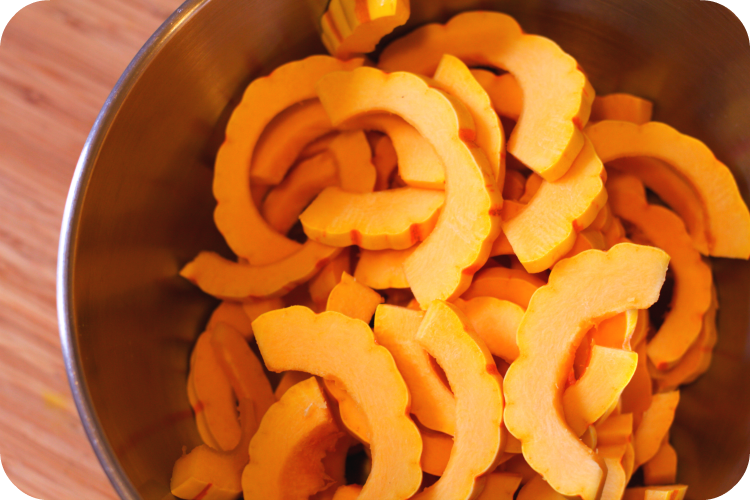 Yellow/Orange: Vegetables such as carrots, sweet potatoes, and pumpkin contain beta carotene and other nutrients for eye health, immune system support, and anti-aging benefits. White: Vegetables such as cauliflower, mushrooms, onions and garlic are needed for their cancer-fighting, inflammation-cooling, immune system-boosting compounds. Each nutrient addresses a specific need or purpose in the body, similar to how a key is designed to match a specific lock. 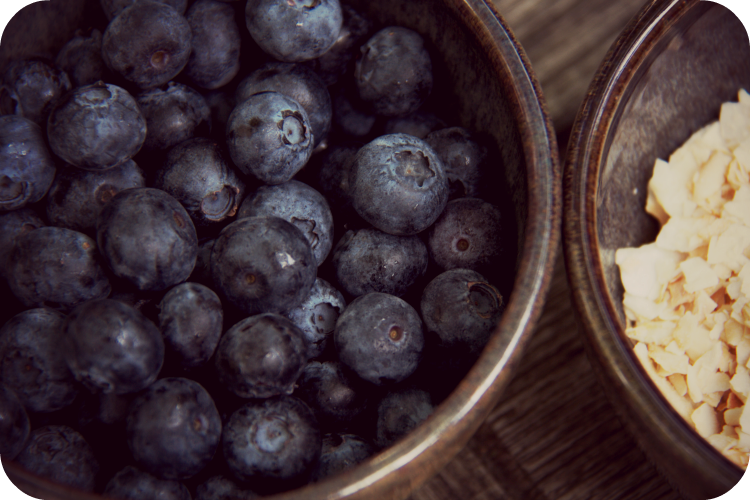 That’s why eating mostly greens — or making sure you routinely put blueberries on top of your oatmeal — is great, but falls short of the overall goal. Over-consuming certain nutrients, while ignoring others, is like trying to win a relay one runner short. When it comes to planning your meals, remember — the more colors, the better. Aim for 2-3 colors a day. Or really go for it and try 2-3 colors each meal. One way to do this might be to add some roasted beets to a leafy green salad. I’ve been enjoying this recipe a lot lately, ever since I bought a 10-pound bag of beets at a local farm (translation: a whole lotta beets). I’ve been roasting three or four at a time, and using them throughout the week for salads — and even smoothies! If you’ve never prepared beets at home, don’t worry — it’s easy! I use an approach I picked up from Mark Bittman years ago. All you do is scrub and rinse the beets, then wrap them up in foil while they’re still wet. Then, you simply roast until they’re tender. After they cool a bit, the skin comes off easily using your fingers — or with a paper towel if you want to minimize beet stains. This is a beautiful dish to prepare for guests. Or, pamper yourself and take it to work as a brown-bag lunch. Either way, you’ll have two major color groups covered. Go ahead and add leftover roasted squash to the salad, or serve it with a side of cauliflower soup, if you really want to rock that rainbow. Scrub the beets under running water with a vegetable brush. Then, wrap each beet individually in a piece of foil (the beets should still be wet). Place the foil-wrapped beets in a baking dish and roast for about 60-90 minutes, until beets are easily pierced with a fork. Time varies with the size of the beets. If they’re especially small, start checking on them after about 30 minutes. While the beets are roasting, prepare the vinaigrette: whisk lemon juice, cumin, honey, garlic, jalapeño, and lemon zest into a small bowl. Slowly whisk in walnut oil until dressing emulsifies. Season with salt and pepper and whisk again. When the beets are finished, open up the foil and let them cool off a bit. When cool enough to handle, take a beet and rub off the skin. I do this over the sink, and with a paper towel to minimize mess (some beet juice will get on your hands, but it washes away with soap and water). 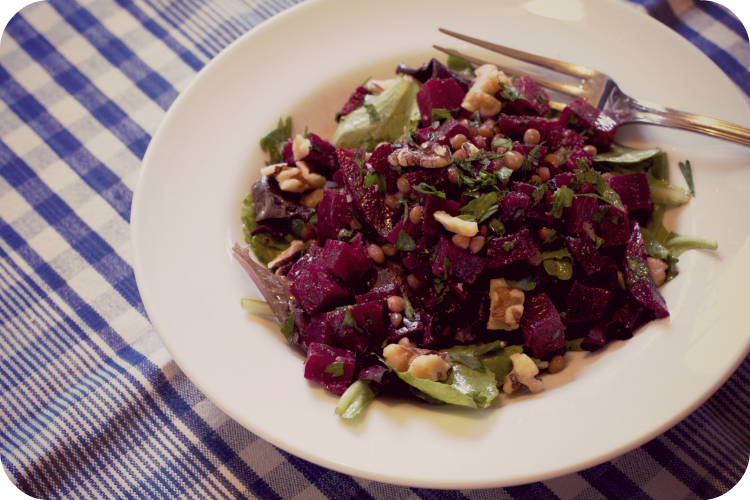 Chop the beets, place into a small bowl with the lentils (if using), and toss gently with a drizzle of vinaigrette. Set the baby greens into a salad bowl and toss with a small amount of vinaigrette — be careful, it’s easy to overdress! Then distribute the dressed beets and lentils over the top. Garnish with chopped parsley and walnuts. Do you like beets? If so, what’s your favorite preparation? Post a comment below — I’d love to hear from you! Thanks Shawn — gotta love beet season!